A Lost Day or a Dream Come True? Samoa lost a day the other day. A whole flipping day! They decided to cross the international dateline for economic reasons, so that their businesses can be ‘closer’ to Australia and New Zealand. This, along with the ever decreasing return that is the celebration of new years, got me thinking. I seem to lose days sometimes. I am not sure what happens but then it is suddenly evening and almost over. It’s not like I even do anything that productive during those days. They slip by in a haze, maybe because of inertia or maybe because of a hangover or whatever. This can be so disappointing, especially for one who professes to believe that we only have one life, ‘Carpe Diem’ and all that! This year I celebrated my fiftieth new year on this planet. Fifty years of existence and of course I wonder about my achievements. But there is a problem with measuring achievement. Many choose to measure their lives in terms of ‘things’; material things, money or how far they have gone in their careers. These are tangible and easy to measure, and this is why people choose to measure them perhaps. But of course these things don’t last and are ultimately meaningless. I feel that when we measure ourselves with such things we forget the impermanence of our existence. Others may choose to measure things in terms of happiness, surely a more difficult thing to measure. How happy are we? How happy are our friends and families? How can we tell? And yet people insist on periodically attempting to measure such things and the new year is one of those times. I have always felt the new year rituals to be disappointing. It is simply another day passing and yet some people almost feel desperate to enjoy themselves. Or at least show others they are enjoying themselves. Have you ever been that single person longing for a kiss as the chimes strike midnight? Only to find you are the over-looked wallflower? The other new year ritual that leads to disappointment is the idea of ‘resolutions’. To me it seems that often planning things or setting goals are inevitably going to lead to a sense of failure. Too many times have I made to do lists or promised myself some great achievement over the last fifty years, only to feel like a failure when I didn’t achieve it all. So this year, no more resolutions or promises. I choose to replace them with dreams. I know this year that some of my dreams may come true but some may not, and this is ok, because they are but merely dreams after all. Big ones and small ones. 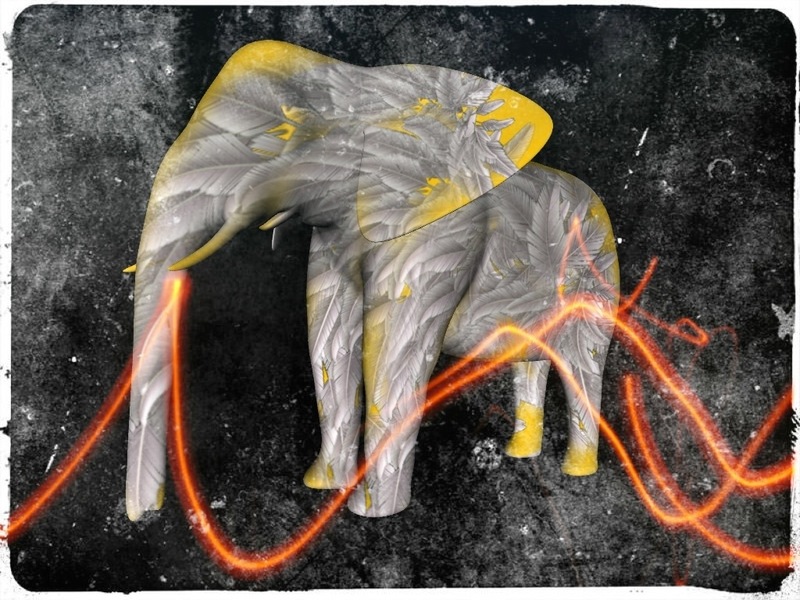 What does the Elephant dream? Next > Glass half full? Great post Simon. I feel much the same about how we try to measure our own success, in whatever sense, and I often worry that I have and do let too many days slip by with nothing much achieved. But like you say – these days can be look at as dreamy days, and their value and purpose may not be apparent at the time, but I think they have both to some degree. Dreams – I like that. I think the need for a sense of balance such as you expressed in saying “maybe I should relish the lazy day with nothing accomplished” is rampant in the world today. Of course you should relish that lazy day because in that lazy day much was accomplished – you were refreshed, relaxed, your mind was free to do what it chose to do and thus you simply enjoyed. Think of it as “l’arte di non fare niente” loosely translated = the art of doing nothing. Thanks for your kind comments! I think this post was me trying to fight any guilt I might have about being lazy. We are all too often beaten down by the Protestant work ethic in the western world, where working hard is virtuous. Me I am trying to embed a little Buddhist calmness into my life; how many monks spend virtually their whole lives trying to do nothing. And they always seem to have a smile on their faces! That’s exactly it for me too Simon. Yes, it’s great to get certain things done, especially if you’re of a creative bent (which I think we all are deep down) but to learn to just be is possibly the most important thing any of us can learn. To be a peace and content with just being – that’s when I really appreciate all the beauty around me… even in the most mundane of things. I never liked making resolutions. New Years is just another excuse to get together with people and have fun (like Friday, Saturday, Sunday, Monday… you get the idea). Resolutions are those dreams and goals you are working on all year, why point them out on one particular day? And as for being lazy, I think it is an important part of living well. Be lazy sometimes. It helps you reset and get more done on the days you are productive. When that voice in your head starts nagging, send it away.